Introduced by Sen. Roger Victory (R) and Rep. Bradley Slagh (R), to allow local governments to enforce an unposted speed limit of 25 mph on streets designated as “local,” if the local jurisdiction has designated the road to be part of their street system, and if it is within land zoned for residential use. Under current law subdivision streets (which have limited entry points) are automatically considered to have a 25 mph speed limit and no speed limit signs need be posted; the bill would extend this posting exception to other streets that are not in subdivisions. 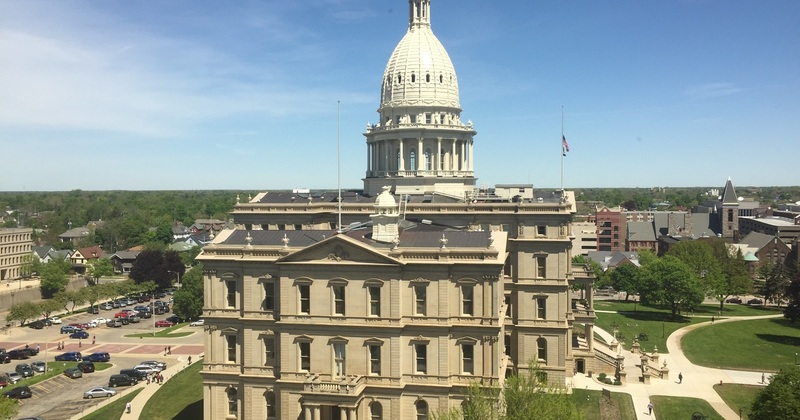 The bill would not require local governments to go through the usual process for setting speed limits, which generally requires agreement from the Michigan Department of Transportation and State Police. Referred to committee, no further action at this time. Introduced by Sen. Betty Jean Alexander (D), to authorize a state income tax deduction for the cost, care and maintenance of a service animal used by a disabled person. Referred to committee, no further action at this time. Introduced by Sen. Ruth Johnson (R), to establish an address confidentiality program for crime victims, with the state Attorney General giving a victim a “designated address” to which mail could be sent and then forwarded to the individual’s current location. This location would not be subject to disclosure under open records and other laws, and the person could also vote in elections using the designated address. Referred to committee, no further action at this time. Introduced by Rep. Pamela Hornberger (R), to eliminate a ban on public schools beginning their school year before Labor Day, and instead prohibit school districts from holding class on a Monday or Friday in August. Referred to committee, no further action at this time. Introduced by Rep. Pamela Hornberger (R), to elect intermediate school district boards in popular votes of the people. Currently only four of 56 Michigan ISDs have boards that are elected by the people, with the rest picked by regular school districts within the ISD. The bill would prohibit ISDs from imposing property taxes unless their governing boards are popularly elected. Referred to committee, no further action at this time. Introduced by Rep. Pamela Hornberger (R), to repeal a provision of the state law that gives cities the power to impose an income tax on the earnings of a nonresident who works for an employer in a city, which are levied at half the rate as the same tax imposed on residents. There are 23 Michigan cities that do this. Referred to committee, no further action at this time. Introduced by Rep. Jeff Yaroch (R), to no longer give $60 million in annual state revenue from state Indian casino compacts to the state department in charge of corporate subsidy programs (the Michigan Strategic Fund), and instead use this money for road repairs. Under current law, the money from these casino compacts goes directly to the corporate subsidy agency each year without a vote of the legislature. Referred to committee, no further action at this time.